John Pomeroy (d.1906) was a partner in retailer David Jones & Co from 1875 to 1892 and a prominent resident of Homebush . 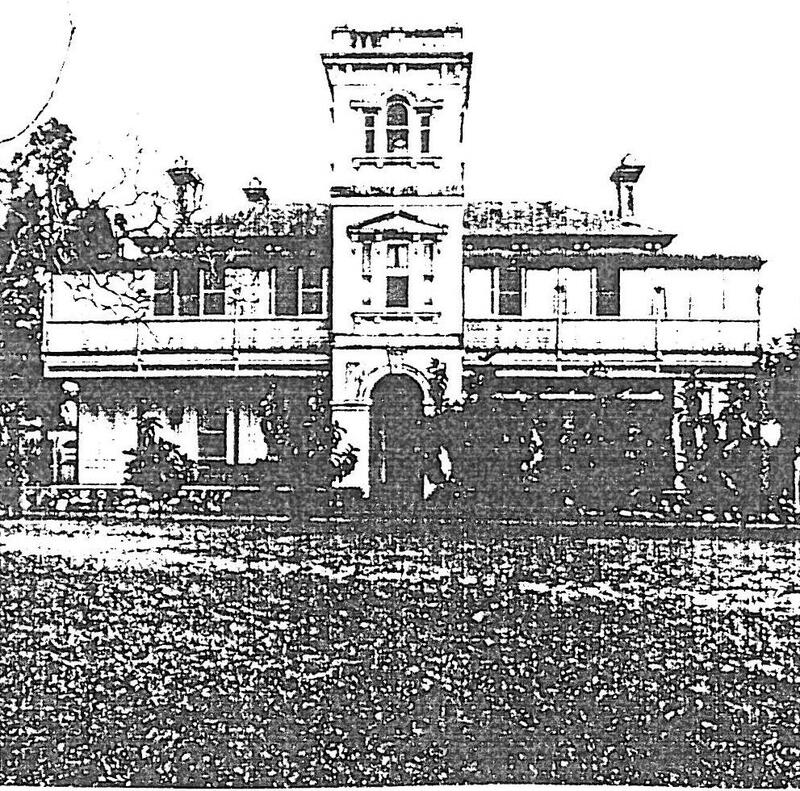 The Pomeroy family lived at ‘Laira’ [later known as ‘Pomeroy House’] in Wentworth Rd, Homebush from c.1887 to 1912. It is not generally known that the management of David Jones & Co, from 1838 until 1906 when the company was publicly listed, was established as a partnership between members of the Jones family and non-family partners such as Pomeroy. Most of the management of David Jones & Co resided in Strathfield including Jones family members [particularly sons and daughters of David Jones but not David Jones himself] and company partners such as John Pomeroy, shoe manufacturer William Newman [‘Chepstowe’ Albert Rd Strathfield], James Emanuel Woodward, Frederick Percy Ford [‘Goomerabong’ cnr Florence St and Albyn Rd] and Thomas James Thompson [‘Malvern’ The Boulevarde]. Both Ford and Thompson were sons-in-law of David Jones. The funeral of the late Mr. John Pomeroy took place yesterday afternoon at Rookwood, and was largely attended. A service was held at Laira, Homebush, and the ceremony at the gravesite was conducted by the Rev. W. Cuncliffe Jones, assisted by the Revs. W. Mathison, , B.A., and R. A. Thompson, B A. (chairman of the Congregational Union of New South Wales). Tho chief mourners wore Messrs, John L. Pomeroy and Arthur S. Pomeroy (sons). Amongst others present were Messrs, James Robortson, T. W. Harris, B. L. Sutton, G. F. Todman, and Dr. Quaife, Messrs. E. Lloyd Jones, J. G. Thompson, P. E. Thompson, and F. P. Ford (members ot the firm of David Jones and Co.), Messrs. John Vernon (Auditor- General), G. R. Short (Commercial Bank, Newcastle), G. M. Buchanan (Melbourne), S. H. Harris, John Wheeler, A. W. Sutton, A. W. S. Gregg, James Gregg, S. H. Lewis, W. H. Shortland , Henry Pratt, A. Wilcox, C. Rees, W. M, Savage, J. Hughes, J. Gamble, John Caswell, Dr. Newman, and employees of the firm of David Jones and Co. Mr. E. K. Satchell (vice- president) represented tho Y.M.C.A., and many, other members of the association were present. The wreaths and floral emblems laid upon the grave were numerous and beautiful. An ATTRACTIVE modern faithfully-built COMMODIOUS RESIDENCE, in spacious grounds of 2 1/4 ACRES, on a hill commanding wide views. By order of the Executrix in the Estate of JOHN POMEROY, Esq. LAIRA is of solid brickwork, cemented, slate roof, tiled verandah on 3 sides, balconies, wide tiled entrance hall and vestibule, drawing and dining rooms (each 20 x 16), breakfast-room, six bedrooms (two each 20 x 30), dressing and bath rooms, servants and box rooms, panto, store .and larder, kitchen, laundry. Brick stabling (two stalls), coachhouse, loft, and man’s room over, tool and man’s room. No expense was spared by late owner to render the property a high-class well-finished residence, cedar and choice fittings. Lofty and richly-corniced rooms. GROUNDS are variedly and strikingly laid out into Shrubberies, Garden, Lawns (1. tennis), small Orchard and Garden, and Fowlyard for home use. LAIRA ranks amongst the Superior Properties of theFix this text Western Suburban Railway Line, with its, frequent through and slow train service. The district enjoys a splendid crisp atmosphere; and this freehold 1s commended to the notice of seekers of a Delightful House and Grounds. at our Rooms, 98 Pitt-Street, at 11.30. The National Trust classified Pomeroy House in the early 1970’s but it was demolished amid much controversy to make way for the M4 motorway (though the eventual motorway was located on a different site). The demolition of this house highlighted the absence of legislative protection for historic properties in NSW and the case of ‘Pomeroy House’ was considered an impetus for the establishment of the first Heritage Act in NSW. Pomeroy St and Pomeroy Reserve [now Bill Boyce Reserve] in Homebush were named after John Pomeroy and his home. I was thrilled to come across this post about John Pomeroy as he was my great-grandfather, his daughter Alice being my grandmother. I have been researching my family history but had not known a lot about John’s life in Australia so this has been quite a revelation. Tragic, however, that the family home was demolished to make way for a motorway that was then built elsewhere, but nice that John’s memory has been kept alive by having a street named after him. I boarded at Pomeroy House in 1964 ,the house at the intersection of Pomeroy St and Wenworth Rd was the residence during first year for Technician in Training PMG employees. The House was I believe owned by a Cyril Horton who lived on the premises and ran it as a boarding house for only PMG employees. I as well boarded in Pomeroy House in 1962 and the house was owned by Cyril Horton and Alan Lane. I have photos of the building if anyone is interested including Tessa Sackin. Yes, I would be very interested to see your photos of Pomeroy House, as the only one I’ve seen to date was very old and not very clear. Would you be able to email them to me? I lived diagonally opposite Pomeroy House in Wentworth Road and it was a landmark. I was saddened to actually witness it’s demolition as well as the church next door that John Pomeroy was a patron of. The church was dark brick and directly next door where Park Road intersected Wentworth Road on a triangular block. This is before the M4 messed up the road alignments and streets re-named. Lower Park Road (now) was originally Wentworth Road. Yes indeed it was then a boarding house for PMG trainees. I remember a huge shady tree and a red phone box outside the old mansion. Harry Bacon’s butcher shop was opposite where Bill Boyce Reserve is now. I should have taken photos at the time as I really did feel a sense of loss seeing the old place being demolished. I would be delighted to see photos of the old mansion if you can provide. Hi Dave, how are you? The only photo I can find of Pomeroy House has been added. Not a great photo, but best I could find. If anyone has anything better, please send it on. I remember when they where about to demolish this boarding house and they had a garage sale to buy any and everything. My dad bought a gate for our house which was just down the road. The gate was still there when I moved in 2001. I also remember them building a large boat made of concrete i think. And the m4 goes exactly under where the boarding house was. They could not of built the m4 with the house still in place. Also hello to Dave Patrick andxI hope you are well mate. Hi Dave, yeah 1 Verley Drive. Dont think its there now. It was half way down the side of the house. Nothing special just a big chain wire gate. I can still remember carrying it down Wentworth Road with my dad. Are you still in the same house? Can’t believe that no one has started a page on facebook, like a “I grew up in Homebush or something. Would love to see some photos of my street Verley Drive before it had all the houses bulldozed for the m4. Vaguely remember some of the houses but most where gone before my memory was working. Lived there from 1966 to 2001. There aren’t many photos of old Strathfield and Homebush in existence. If I find something or someone sends a photo in, I usually try to publish. I am attempting to send a couple of photos and not sure how to attach them to the Strathfield Heritage messages we have been sharing so trying to attach them. These two photos were taken by me in 1962, not the best of photos but my shooting skills and camera equipment have both improved since then. I have a couple more but will wait and see what happens with these. Send them via email to cathy.jones@optusnet.com.au. I’m going to do some work on the site and amend some pages in the next few days. Dave my old house is still there but the house next door was knocked down and a two storey was just put up in its place.